Classic chart-sized sparkly stars communicate accomplishment and praise. Great for homework, incentive pads and charts, invitations and party favors. 7 designs; 4 sheets; 400 stickers. 7/16" diameter. Friendship is Magic with this My Little Pony sticker party favor set. Set of 2 sticker party packs. Each pack has 8 sheets of stickers, for a total of 16 individual sheets. Each sticker pack has over 190 stickers; for a total of more than 380 stickers. Includes 2 separately licensed reward stickers. Large stickers measure 3X3 inches. 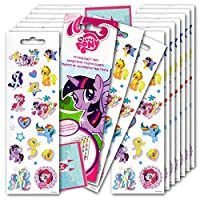 Perfect as My Little Pony party supplies, party favors, reward charts, motivational stickers, reward stickers or just for fun!Sure to be a hit with any MLP fan! 1 design; 4 sheets; 400 stickers. 7/16" diameter. 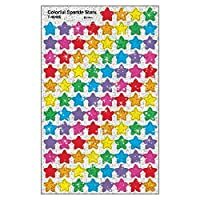 Stickers Classic chart-sized sparkly stars communicate accomplishment and praise. Great for homework, incentive pads and charts, invitations and party favors. Acid-free, nontoxic, and photo-safe. Fun assortment in each pack. Great for party favors, storytelling, and awards, too! Smallest sticker 7/16" diameter; largest 1-11/16" x 2-9/16". 336 stickers. Pad 5.75" x 9.5"
♥ Adhesive Backs - Just pealing the paper off the back as the backs are adhesive and it can be sticked securely to paper, walls, ground or blackboards. ♥ Pretty Colored Glitter Shapes - Star and heart shapes - colorful and bright! Fun assortment in each jumbo pack. Great for party favors, storytelling, and awards, too! 65 designs; 20 sheets. 648 stickers, 5/8" to 1" across. 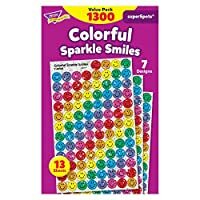 Reward kids with these large, sparkling smiles in assorted colors. Great on homework, incentive pads and charts, and more. 7 designs; 4 sheets; 160 stickers. 11/16" diameter. Perfect for tracking progress on Incentive Pads and Charts, and spotlighting success. Acid-free, nontoxic, and photo-safe. Sheets may vary from photo. 36 designs, 13 sheets, 432 stickers. Each sticker about 1/2" diameter. Large, sparkling stars in assorted colors get attention and spread cheer. Great on homework, invitations, notes, and more. Kids love to collect and trade them. 6 designs; 4 sheets; 180 stickers. About 5/8" diameter. Stickers Large, sparkling stars in assorted colors get attention and spread cheer. Great on homework, invitations, notes, and more. Kids love to collect and trade them. Acid-free, nontoxic, and photo-safe. 15 designs, 2 sheets, 40 stickers. Sizes vary, typically 0.5" to 1.25"
Various colors are provided to meet all your need. Self adhesive is easy and convenient to use without extra glue. Perfect for Valentine's Day decorations and DIY crafts. 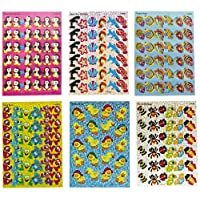 Ideal for home-made Valentine cards, decorating posters of your favorite musician or movie star, or even sticking to your boxes, envelopes, bags, notebook covers, etc. Great for scrapbooks, gift wrap, photo albums, frames, stationary, etc. Cute, colorful stickers help spotlight good behavior, boost motivation, and make good habits stick.